In this article, we go through a list of best IFB washing machine available in India as of 2019. Both front and top load fully automatic washing machines have been listed. Price of these washing machines is between Rs. 15000 to Rs. 35000. Capacity varies between 6 kg and 8 kg which is suitable for a family of 3-5 members. If you are looking for an ifb washing machine under 20000, 25000, 30000 or 35000, you will find it here. IFB front load fully automatic washing machines are the best in this segment because of their great quality and performance. They also come with a 4-year comprehensive warranty from IFB. IFB after sales network is good as well so you are covered for 4 years. IFB doesn't make semi-automatic washing machines, so go for LG or Whirlpool if you are looking for a semi-automatic washing machine. Check out the best semi-automatic washing machines under 15000. Front load washing machines usually cost more than top load washing machines and offer better wash with less water consumption. If your budget is low then you can go for top load washing machines. Do take a look at the specs below whether the machines come with an inbuilt water heater or not. An inbuilt heater is helpful as warm water easily removes tough stains. If your clothes are not that dirty then the heater is not important. Let's take a look at specifications, pros cons and review of best IFB washing machines available in India. We have provided reviews and price list of the best IFB washing machines below. This is the most affordable washing machine from IFB and it comes with a capacity of 6.5 Kg. It is a top load fully automatic washing machine and is suitable for a family of 3-4 members. IFB is one of the best brands in fully automatic washing machines and they offer a 4-year comprehensive warranty on these washing machines which is a big positive. The washing machine has Auto Imbalance Vibration Control Technology which balances the clothes automatically and maintains stability. Another interesting feature is Ball Valve Technology which helps in preventing wastage while enhancing the wash quality. The valve lets the water drain out and keeps the detergent inside the machine. The motor power is 360W and the RPM is 720. Both these numbers are decent for a top load washing machine. There are 6 different wash programs like Cold Wash, Time Delay, Bleach Dispenser, Tub Dry, Air Dry. You can select these depending on the type of clothes you are washing. Overall, it is great performing top load fully automatic washing machine from IFB under Rs. 20000 in India. This is a high capacity washing machine from IFB which is our favourite brand in fully automatic washing machines category. It comes with a large capacity of 8.5 kg suitable for families with 5-6 members. The drum is built of stainless steel and feels long lasting and durable. The washing machine comes with a fresh design and looks beautiful. It works great as well. The motor can run at 1400 RPM which is excellent and you can adjust the spin speed as per your requirement. There are plenty of wash programs (like Woollen, baby wear, cotton, synthetic and a lot more) to choose from depending on what type of clothes you are washing and what kind of wash do you want. As seen in all the higher range washing machine, this machine also has an inbuilt heater and you can adjust the temperature setting as per your need. As always, you get a 4-year comprehensive warranty from IFB on this washing machine. Washing machines do tend to get problems because of moving parts so more warranty coverage is great and IFB is the brand which provides 4-year warranty and that's why they are our favourite. Along with the 4-year warranty, IFB is also offering 10 Years Spare Parts Support on this machine. Go for it if you are looking for a fully automatic front load washing machine under 40000. Warranty 4 Years Comprehensive IFB Warranty. IFB is great when it comes to fully automatic front load washing machines. This machine comes with a decent capacity of 6.5 Kg which is suitable for a family of 3-4 members. The build quality of the machine is great and the motor is very powerful as well. It has 100 wash programs which cover a wide range. The machine has enough space for the clothes to roll around. It is a Smart machine and you can control the washing machine with your smartphone by downloading the Smart App that works via Bluetooth. There's inbuilt heater as well which is used to remove tough stains from clothes. This machine works well even with the hard water due to its Aqua energy feature which converts the hard water into soft water. Apart from these special features and powerful performance, IFB also offers a 4-year comprehensive warranty from IFB and IFB does have a good after sales network, so you are covered for 4 years. If you need a fully loaded fully automatic front load washing machine under 30000 then this is a good option. IFB is probably the best and our favourite brand when it comes to front-load fully automatic washing machines. This is another excellent front load machine from IFB with a decent capacity of 6.5 kg which is suitable for a family of 3-4 members. The motor is very powerful and has an RPM of 1000. 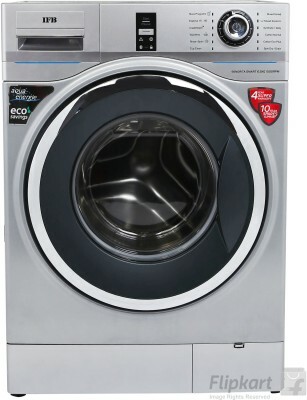 It has 8 wash programs and has an inbuilt heater as well which is useful if your clothes have tough stains and you can adjust the temperature between 30, 40, 60 and 90 degrees. It uses an Auto Balance System that itself balances the clothes even the clothes weight is uneven so that proper effective cleaning is maintained. It has Crescent Moon Drum that rotates the water in a pattern to prevent any damage to the clothes when the run against each other and the drum walls. IFB offers a 4 years warranty on this front load fully automatic washing machine which is the best thing about it. IFB has good after sales network, so if anything goes wrong with your washing machine for next 4 years, they will fix it. It is one of the best washing machines under 30000 in India and has great value for money. IFB is our favourite brand when it comes to front-load fully automatic washing machines. This is another excellent front load machine from IFB with a decent capacity of 6.5 kg which is suitable for a family of 3-4 members. The motor is very powerful and has an RPM of 1000. 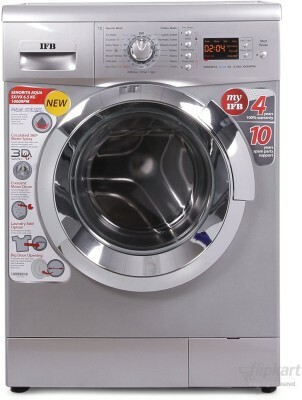 It has 8 wash programs and has an inbuilt heater as well which is useful if your clothes have tough stains. This machine has a 3D Shower System Technology which rotates the water in 360 degrees and completely dissolves the detergent for improved cleaning. IFB machines also come with a feature of Aqua Energie that converts hard water into soft water so that your clothes are not harmed and hence can be easily used in areas having hard water connection. IFB offers 4 years warranty on their front load fully automatic washing machine which is the best thing about it. IFB has good after sales network, so if anything goes wrong with your washing machine for next 4 years, they will fix it. One of the best washing machines under 25000 to 27000 in India. So this was our list of best IFB washing machines available in India 2019. We hope it was helpful and you were able to find a suitable washing machine according to your usage and budget. Take a look at some of our other articles where we have covered best washing machines under 10000, 15000, 20000, 25000 and 30000. If you are looking for a fully automatic machine, check out the best options from Bosch and Samsung as well. Bosch recently entered the Indian market and they have launched a wide range of fully automatic top and front load washing machines in India.